The first and my favorite! Lie on your back at the end of your bed or other flat surface. Pull both knees towards your chest and then let one leg hang off the edge until you feel a stretch in the hip flexor and thigh. Hold 15 seconds, repeat 2-3 times each side. Get into a half-kneeling position, tighten your abdominal muscles and tuck your pelvis under. Increase the bend in your front knee for more stretch in the hip flexor. Raise arms overhead and turn the torso towards the knee that is up to increase the stretch and feel it in a slightly different location of the hip flexor. Hold 15 seconds, repeat 2-3 times each side. Stand with left hand holding onto the wall or the counter. Cross the left leg over the right keeping most weight on the right leg. 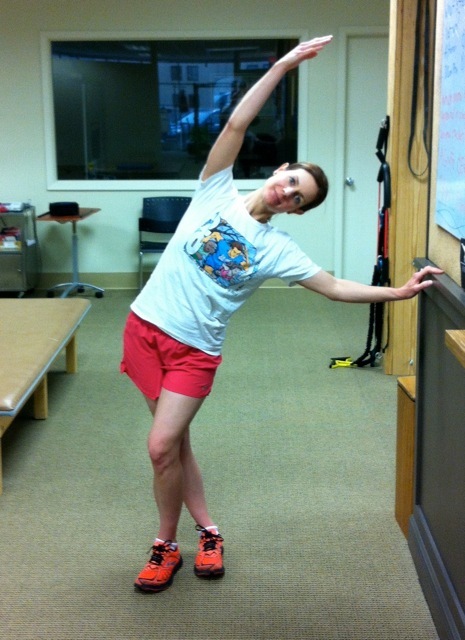 Lean into the right hip and stretch the right arm overhead. Hold for 15 seconds, repeat 2 times. 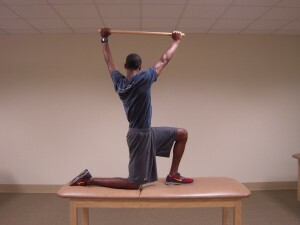 Turn around and repeat the exercise with the other leg placing the right hand on the wall.